Ali lives in Basra, Iraq in 1991 with his family, including brothers Ahmed and Shirzad and young sister Shireen. His mother is a math professor, his father is a dentist and army medic reservist, and the family lives a comfortable life complete with video games and American television programs. Ali has known war for much of his life, but when the US prepares to launch Dessert Storm attacks, he realizes how much more serious this war is. Since bridges have been bombed, food is scarce. More buildings are destroyed and people are killed. Ali's father goes missing, and the family is worried for his safety. While Ali is not a fan of school, he would rather be there than huddled at home while war rages around him. When there are rumors that a ground strike will be made soon, Ali considers finding a way to let the US soldiers know that he loves Superman and video games, but realizes it will have little effect. In an epilogue, we see Ali working at a translator for the US government during Hussein's trial, and notes at the end explain the true story on which the book is based. 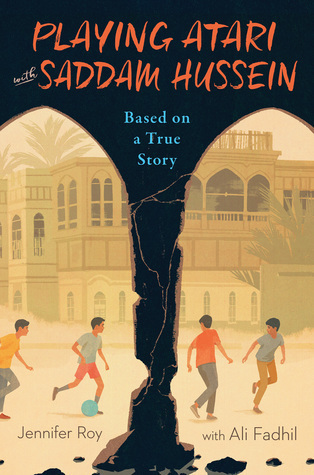 Strengths: This was really well done-- first hand experiences from Mr. Fadhil, but told by an experienced middle grade writer so that the book is structured in an appealing and fast-paced way. I appreciated the inclusion of information about the different ethnic groups and their involvement, especially since Ali's father is Kurdish. There are plenty of details of ordinary life in Basra, and we get a lot of historical information about the war as well. Even the cover is fantastic. This is a great window into another time and place, and I can't wait to share it with my students! Weaknesses: Ms. Roy does not write nearly enough books! I love her Yellow Star, as well as the Trading Faces series she wrote with her twin, Julia DeVillers. What I really think: This seemed a bit pro-American, but there are some passages that describe how much Ali loves Iraq, just not the Iraq during war time. Now, I really need to see a book by an Iraqi who felt less positively about the US!